I LOVE the colors of the Perfect-Fit Mixed-Tape Cardigan; the Perfect-Fit tanks are super comfy layering pieces too. I’m also crazy about the Vintage Cotton V-neck tee . I always layer. I have a tough time wearing a woven/button-down shirt without a tank underneath, so the perfect-fit tank is my best (clothing) friend. What are your favorite basic pieces from J. Crew (or elsewhere!)? Do tell! P.S. I have a great giveaway planned when I reach 75 followers! Spread the word! I popped into Ann Taylor Loft today because they’re offering 30% off of everything. I tried on and purchased the Lace Pencil Skirt with Ponte Lining. Let me tell you dear readers, this skirt is perfection! I will post pics later today! Have you tried this skirt on? Do tell! I’ve been eyeing the Hacking jacket since it was released on the J. Crew website. I initially ordered the Midnight Ocean color. I couldn’t figure out how it would fit into my wardrobe and my in-store PS didn’t like the color on me. So, we decided to try the Heather Dark Grape color. This color didn’t work on me either. And, I think the fit is off on me. I think I need to stick with the Schoolboy Blazer. So, I exchanged the Hacking Jacket for this Schoolboy Blazer (I don’t see it online). What do you think of this Schoolboy Blazer? 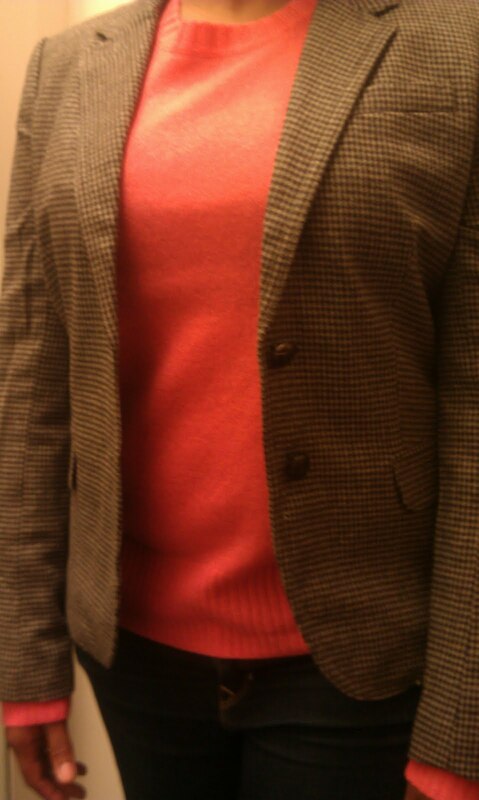 Initially, I overlooked this blazer. However, I became intrigued by it after one of my daily visits to the J. Crew website. What do you think of this blazer?